Unless the movement gets more strategic about its image, it may end up talking to itself. From its inception, the Occupy movement has had a contentious relationship with the mainstream media. On September 17, a few hours into the first day of the occupation, as a couple of hundred people assembled in Zuccotti Park, some demonstrators were already complaining of a “media blackout.” I was there, as an enthusiastic participant, yet even I wasn’t convinced the event was particularly newsworthy: in May more than 10,000 people had marched through nearby streets airing similar grievances; a month later protesters camped for two weeks outside City Hall as part of a protest called Bloombergville. Yet accusations flew through the Twittersphere. The traditional media are ignoring us! Why aren’t we big news? Before long, Occupy Wall Street would be. When protesters managed to hold their ground through the weekend, sleeping on hard concrete and eating pizza donated by well-wishers from around the world, reporters began dutifully to file stories. But the charge of a media “blackout” persisted until September 24, when shaky video of several young women being cordoned off and pepper-sprayed point-blank by a white-shirted police officer was uploaded to YouTube. With that video Occupy went viral, and by going viral it went mainstream. Over the six months since, through an unpredictable combination of savvy social media use and name-brand coverage, Occupy has cast a tremendously large shadow, making an impact in many ways disproportionate to the numbers of people involved in the core actions. By embracing transparency and pursuing maximum visibility, the protest on Wall Street provided, in the words of one activist, a “virtual template for occupation” that inspired people around the world to follow suit. But now, as Occupy endeavors to find its footing in a post-encampment phase, it may need a new approach. The limitations of social media and the downside of total transparency are revealing themselves just as mainstream media attention is waning. If Occupy doesn’t become more strategic about the images and messages it projects, the movement may be left talking to itself. Left-wing activists have long had a rocky rapport with the mainstream media; in this respect, Occupy is nothing new. Organizers tend to be deeply suspicious of the corporate press, which generally ignores or belittles them. At the same time, they need mainstream outlets to spread their messages and grow their movements. One might ask, philosophically, If there’s a protest and no reporters show up, did it really happen? Nobody knew this better than Martin Luther King Jr., who had a knack for staging dramatic, mediagenic confrontations. In 1965 during the march to Selma, Alabama, he told a Life photographer who had put down his camera to help a protester being beaten by police to go back to taking pictures: “Your role is to photograph what is happening to us.” If King was an organizer working today, he’d remind protesters to keep photographing themselves. Theoretically at least, there are now as many “channels” as there are people attending an event. With social media, every protester can broadcast his or her experiences and opinions for public consumption. But Occupy’s habit of obsessive self-documentation isn’t just pragmatic—it’s a matter of principle deeply woven into its DNA. “Without a doubt, a founding principle of OWS is transparency,” says Carrie, a member of the Occupy Wall Street facilitation and minutes working groups (who asked that I not give her last name). “We are trying to create within OWS what we want to see in the wider world. Too much happens behind closed doors in our society, so it’s incredibly important to put it all out there, both the good and the bad, so people can make up their own minds.” To this end, each Occupy Wall Street working group has to post minutes from its meetings online (check out nycga.net). The goal is for everything that happens at Occupy Wall Street to be visible to anyone who wants to know about it. Even so, when you are committed to making everything visible, the results aren’t always pretty. Carrie is one of the people regularly behind @LibertySqGA, an account that tweets from the OWS General Assembly and Spokes Council meetings, which take place many nights a week, allowing those who can’t attend to follow along. She has a second Twitter account, a personal one, where she simultaneously posts commentary—“analysis in real time,” as she calls it. Tweets from both accounts paint a vivid and sometimes troubling picture of what’s happening in the room, as when she recently alerted her followers that a fight had broken out. “Horrifically, @DiceyTroop was calling out Jeff from Housing for threatening him,” she tweeted. “and jeff punched dicey in the face. #ows #nycga.” Word of the unsettling incident—hardly a common occurrence at an Occupy-related meeting—went out, instantaneously, to more than 1,000 people. Or consider Tim Pool, a young man from Chicago who became one of the most famous faces of Occupy Wall Street because of his popular ustream channel TheOther99 and, later, Timcast. Pool says that transparency is what attracted him to Occupy, and he keeps his camera rolling at all times. He has had heated arguments, transmitted live, with activists who didn’t want to be filmed (most notably he got into a fight with some people letting the air out of the tires of a police car who didn’t want to be caught on tape; and there have been instances where people on marches have simply requested that he point his camera elsewhere). In January Pool’s commitment to transparency took on a new hue when he had a public feud, waged partly on Twitter, with his ex-collaborators about control of TheOther99 and about accusations that thousands of dollars in donations had been mismanaged. It’s a common complaint among activists that the mainstream media tend to misrepresent them. As Rebecca Solnit pointed out in a recent piece about a January 28 Occupy Oakland action called Move-In Day, activists are often painted as violent (not to mention unwashed, incoherent or otherwise alienating). This is true. At the same time, in the new media order, protesters are equally capable of presenting themselves in an unflattering light, sharing their foibles and failures with the world and offering critics a vast well to draw from. For some, admitting imperfections and problems is a necessary step on the path to growth. Carrie believes that transparency becomes more important the messier things are on the ground. “It’s part of the challenge of creating a movement that’s horizontal, from the bottom up. I think it’s important that people know how hard this is. It doesn’t discredit the movement to show that—it’s just honest,” she told me. “Also, not to give too much credit to what’s happening in New York, but it’s true that other occupations look to OWS as a model. We shouldn’t give the impression we’re having this easy time, or that our process is perfect and we’ve figured everything out, because we haven’t.” The movement will be stronger, Carrie maintains, if it can look at and learn from its mistakes. Feidt has a similar perspective, though he emphasizes the need for constructive framing, arguing that “responsible movement media work” also entails contextualizing “unvarnished and unedited” material so that it makes sense and doesn’t estrange people who come across it. Since day one, Occupy has done a heroic job of making its own media and working with progressive outlets to spread the good word. In addition to GlobalRevolution.tv—Tim Pool and others livestreaming around the clock—protesters across the country turned out movement papers, from the Occupied Wall Street Journal to the Occupied Boston Globe to the Occupied Oakland Tribune, and journals like Tidal: Occupy Theory and the Occupy! Gazette (which I helped edit). They have distributed thousands of posters (see occuprint.org), spawned hilarious memes (think “pepper spray cop”) and made podcasts and documentaries augmenting and correcting the mainstream media’s portrayal of events (like Brandon Jourdan’s The Battle of Oakland, a detailed account of the Move-In Day action). In addition, untold millions of Occupy-related blog posts, Tumblr entries and status updates have filled the ether. Meanwhile, the traditional media are already losing interest. 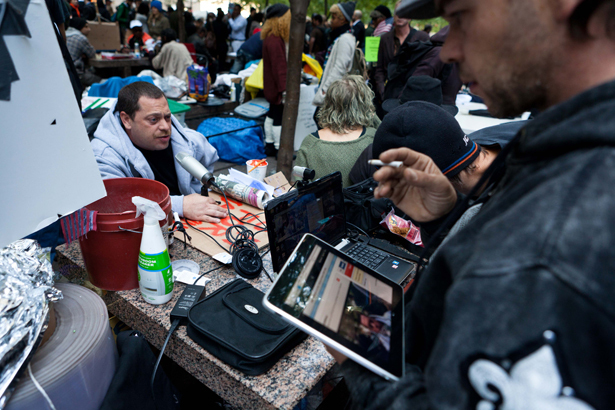 Six months in, with an election year under way, Occupy is old news. To be fair, part of the problem for reporters is that Occupy, sprawling and leaderless from the get-go, is even more difficult to report on without encampments providing a central meeting ground. Even the most dedicated participants find it impossible to keep abreast of everything that’s going on locally and nationally within their movement. While some promising initiatives, like InterOccupy, aim to change this, a major task for Occupy in the coming months will be making the scope of its actions intelligible to as many people as possible, including those who are part of it. More important, the movement has to figure out how to define itself outside media cycles, mainstream or otherwise. After all, social media share some of the worst attributes of their conventional counterpart: they tend to speak in sound bites, cater to short attention spans and are prone to sensationalism and hearsay. Patrick worries that social media, with their abbreviated format, aren’t the best venues for what he calls “political maturation.” They feed into and embolden “some of the worst aspects of the left and anarchist culture, encouraging argument and snarkiness and infighting,” he laments. But all is not lost. As Occupy regroups and readies for spring, the next phase may be a chance for organizers to focus attention on the issues that originally motivated the protests. The encampments were indeed bait for reporters, but they lent themselves to shallow coverage—for instance, of the logistics of daily life (where do people go to the bathroom? why won’t the drum circle quiet down?) instead of the bigger question of why people were there. It’s worth noting that the first big day of action after the eviction of Zuccotti Park, the December 6 nationwide Occupy Our Homes campaign, garnered almost universally positive coverage, concentrating attention on the foreclosure scandal and the economic crisis. That campaign could provide a kind of blueprint for the messaging of future actions. But for such a media blueprint to work, Occupy needs momentum: namely, real organizing efforts, rooted in local communities, that are worth talking and writing about. The best media, whether mainstream, grassroots or whatever is in between, can be made only after the hard work of organizing is done.